Adam Smith, FRSE, (baptised and probably born June 5, 1723 O.S. (June 16 N.S.) – July 17, 1790) was a Scottish political economist and moral philosopher. His Inquiry into the Nature and Causes of the Wealth of Nations was one of the earliest attempts to study the historical development of industry and commerce in Europe. That work helped to create the modern academic discipline of economics and provided one of the best-known intellectual rationales for free trade, capitalism, and libertarianism. Smith was a son of the controller of the customs at Kirkcaldy, Fife, Scotland. The exact date of his birth is unknown, but he was baptised at Kirkcaldy on June 5, 1723, his father having died some six months previously. At around the age of 4, he was kidnapped by a band of Gypsies, but he was quickly rescued by his uncle and returned to his mother. Smith recovered from this ordeal quickly and resumed his close relationship with his mother on his safe return home. Smith's biographer, John Rae, commented wryly that he feared Smith would have made "a poor Gypsy." He was also an only child as we have no record if he had any siblings. At the age of fourteen, Smith proceeded to the University of Glasgow, studying moral philosophy under "the never-to-be-forgotten" (as Smith called him) Francis Hutcheson. Here Smith developed his strong passion for liberty, reason, and free speech. In 1740 he entered Balliol College, Oxford, but as William Robert Scott has said, "the Oxford of his time gave little if any help towards what was to be his lifework," and he left the university in 1746, becoming a public critic of its process of tenure. In 1748 he began delivering public lectures in Edinburgh under the patronage of Lord Kames. Some of these dealt with rhetoric and belles-lettres, but later he took up the subject of "the progress of opulence," and it was then, in his middle or late 20s, that he first expounded the economic philosophy of "the obvious and simple system of natural liberty" which he was later to proclaim to the world in his Inquiry into the Nature and Causes of the Wealth of Nations. In about 1750 he met David Hume, who became one of the closest of his many friends. With others who played an important role in the emergence of the Scottish Enlightenment, he frequented The Poker Club of Edinburgh. Coase, Professor of Economics and journal editor, challenged the view that Smith was a Deist, stating that, whilst Smith may have referred to the "Great Architect of the Universe", other scholars have "very much exaggerate[d] the extent to which Adam Smith was committed to a belief in a personal God". He based this on analysis of a remark in The Wealth of Nations where Smith writes that the curiosity of mankind about the "great phenomena of nature" such as "the generation, the life, growth and dissolution of plants and animals" has led men to "enquire into their causes". Coase notes Smith's observation that: "Superstition first attempted to satisfy this curiosity, by referring all those wonderful appearances to the immediate agency of the gods. Philosophy afterwards endeavoured to account for them, from more familiar causes, or from such as mankind were better acquainted with than the agency of the gods." Coase argues that this is "hardly a remark which would have been made by a strong, or even a mild, deist". In 1751 Smith was appointed chair of logic at the University of Glasgow, transferring in 1752 to the chair of moral philosophy. His lectures covered the fields of ethics, rhetoric, jurisprudence, political economy, and "police and revenue". In 1759 he published his The Theory of Moral Sentiments, embodying some of his Glasgow lectures. This work, which established Smith's reputation in his day, was concerned with how human communication depends on sympathy between agent and spectator (that is, the individual and other members of society). His analysis of language evolution was somewhat superficial, as shown only 14 years later by a more rigorous examination of primitive language evolution by Lord Monboddo in his Of the Origin and Progress of Language. Smith's capacity for fluent, persuasive, if rather rhetorical argument, is much in evidence. He bases his explanation, not as the third Lord Shaftesbury and Hutcheson had done, on a special "moral sense", nor (as Hume did) on utility, but on sympathy. Smith now began to give more attention to jurisprudence and economics in his lecture and less to his theories of morals. An impression can be obtained as to the development of his ideas on political economy from the notes of his lectures taken down by a student in about 1763 which were later edited by Edwin Cannan, and from what Scott, its discoverer and publisher, describes as "An Early Draft of Part of The Wealth of Nations", which he dates about 1763. Cannan's work appeared as Lectures on Justice, Police, Revenue and Arms. A fuller version was published as Lectures on Jurisprudence in the Glasgow Edition of 1976. At the end of 1763 Smith obtained a lucrative offer from Charles Townshend (who had been introduced to Smith by David Hume), to tutor his stepson, the young Duke of Buccleuch. Smith subsequently resigned from his professorship and from 1764-66 traveled with his pupil, mostly in France, where he came to know intellectual leaders such as Turgot, Jean D'Alembert, André Morellet, Helvétius and, in particular, Francois Quesnay, the head of the Physiocratic school whose work he respected greatly. On returning home to Kirkcaldy he devoted much of the next ten years to his magnum opus, An Inquiry into the Nature and Causes of the Wealth of Nations, which appeared in 1776. It was very well-received and popular, and Smith became famous. In 1778 he was appointed to a comfortable post as commissioner of customs in Scotland and went to live with his mother in Edinburgh. He died there on July 17, 1790, after a painful illness and was buried in the Canongate Kirkyard, Royal Mile, Edinburgh. He had apparently devoted a considerable part of his income to numerous secret acts of charity. Smith's literary executors were two old friends from the Scottish academic world; physicist/chemist Joseph Black and pioneering geologist James Hutton. Smith left behind many notes and some unpublished material, but gave instructions to destroy anything that was not fit for publication. He mentioned an early unpublished History of Astronomy as probably suitable, and it duly appeared in 1795, along with other material, as Essays on Philosophical Subjects. The Wealth of Nations was influential since it did so much to create the field of economics and develop it into an autonomous systematic discipline. In the Western world, it is arguably the most influential book on the subject ever published. When the book, which has become a classic manifesto against mercantilism (the theory that large reserves of bullion are essential for economic success), appeared in 1776, there was a strong sentiment for free trade in both Britain and America. This new feeling had been born out of the economic hardships and poverty caused by the American War of Independence. However, at the time of publication, not everybody was immediately convinced of the advantages of free trade: the British public and Parliament still clung to mercantilism for many years to come. The Wealth of Nations also rejects the Physiocratic school's emphasis on the importance of land; instead, Smith believed labour was paramount, and that a division of labour would effect a great increase in production. Nations was so successful, in fact, that it led to the abandonment of earlier economic schools, and later economists, such as Thomas Malthus and David Ricardo, focused on refining Smith's theory into what is now known as classical economics. Both Modern economics and, separately, Marxian economics owe significantly to classical economics. Malthus expanded Smith's ruminations on overpopulation, while Ricardo believed in the "iron law of wages" — that overpopulation would prevent wages from topping the subsistence level. Smith postulated an increase of wages with an increase in production, a view considered more accurate today. One of the main points of The Wealth of Nations is that the free market, while appearing chaotic and unrestrained, is actually guided to produce the right amount and variety of goods by a so-called "invisible hand" (an image that Smith had previously employed in Theory of Moral Sentiments, but which has its original use in his essay, "The History of Astronomy"). If a product shortage occurs, for instance, its price rises, creating a profit margin that creates an incentive for others to enter production, eventually curing the shortage. If too many producers enter the market, the increased competition among manufacturers and increased supply would lower the price of the product to its production cost, the "natural price". Even as profits are zeroed out at the "natural price," there would be incentives to produce goods and services, as all costs of production, including compensation for the owner's labour, are also built into the price of the goods. If prices dip below a zero profit, producers would drop out of the market; if they were above a zero profit, producers would enter the market. Smith believed that while human motives are often selfish and greedy, the competition in the free market would tend to benefit society as a whole by keeping prices low, while still building in an incentive for a wide variety of goods and services. Nevertheless, he was wary of businessmen and argued against the formation of monopolies. In the Wealth of Nations Smith claims that self-interest alone (in a proper institutional setting) can lead to socially beneficial results. But in his Theory of Moral Sentiments Smith says that sympathy is required to achieve socially beneficial results. On the surface it appears that a contradiction exists. Economist Joseph Schumpeter referred to this in German as das 'Adam Smith-Problem'. In recent years, however, most students of Adam Smith's work have argued that no such contradiction exists. In the Theory of Moral Sentiments, Smith develops a theory of psychology in which individuals in society find it in their self-interest to develop sympathy as they seek approval of what he calls the "impartial spectator." The self-interest he speaks about is not a narrow selfishness but something that involves sympathy. Economists, and others, who have read The Wealth of Nations (falsely) presume that when Smith speaks of "self-interest" in that book he is speaking of selfishness. Although in some contexts, such as buying and selling, sympathy generally need not be considered, Smith makes it clear that he regards selfishness as inappropriate--if not immoral--and that the self-interested actor has sympathy for others. That is, no Adam Smith Problem exists. 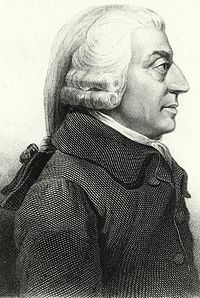 In any case, Adam Smith himself cannot have seen any contradiction, since he produced a slightly revised edition of Moral Sentiments after the publication of The Wealth of Nations. Both sets of ideas are to be found in his Lectures on Jurisprudence. He apparently believed that moral sentiments and self-interest would always add up to the same thing. Some scholars, however, have given another explanation: Adam Smith was trying to illustrate the complicated economy with two simple dimensions. It was the people who, due to historical limitations, emphasized the "wealth" part. In the future, due to the change of world economy, the emphasis may well change. The Wealth of Nations, one of the earliest attempts to study the rise of industry and commercial development in Europe, was a precursor to the modern academic discipline of economics. It provided one of the best-known intellectual rationales for free trade and capitalism, greatly influencing the writings of later economists. There has been some controversy over the extent of Smith's originality in The Wealth of Nations. Some argue that the work added only modestly to the already established ideas of thinkers such as Anders Chydenius (The National Gain (1765), David Hume and the Baron de Montesquieu. Indeed, many of the theories Smith set out simply described historical trends away from mercantilism and towards free trade that had been developing for many decades and had already had significant influence on governmental policy. Nevertheless, Smith's work organized their ideas comprehensively, and so remains one of the most influential and important books in the field today. Smith was ranked #30 in Michael H. Hart's list of the most influential figures in history. A portrait of Smith can be seen on a Bank of Scotland fifty pound sterling note. He will also feature on a new series of twenty pound sterling notes to be issued by the Bank of England in the spring of 2007. He will become the first Scotsman to appear on an English note. ^ R. H. Coase. "Adam Smith's View of Man" (PDF). University of Chicago Graduate School of Business. ^ "Smith replaces Elgar on £20 note" BBC News website, retrieved 29 October 2006. Samuel Hollander , 1973. "Studies in Classical Political Economy/I The Economics of Adam Smith (Toronto: University of Toronto Press and London: Heinemann), x + 350"